Be sure to check out the July 2016 issue of Keyboard Magazine! 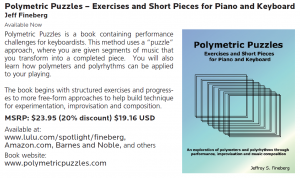 There is an interesting article written by Robbie Gennet entitled “Polymetric Puzzles – Expand your skills playing polyrhythms and polymeters”. Check it out here. Please send a link to your examples along with a brief description of your analysis to the author Jeff at jeff@polymetricpuzzles.com. These examples will be posted on the Polymetric Puzzles site. Link to Meet the author and watch examples from the book. Additional videos will be posted in May 2015. Having difficulties with a particular Polymetric Puzzle? Feel free to email the author for suggestions at jeff@polymetricpuzzles.com. Also, you can get a head start by trying the solutions in the appendix at the back of the book. in the following issues: November 2014, December 2014 and January 2015. Be sure to get your copy at www.keyboardmag.com or wherever Keyboard Magazine is sold.